Inspired by this blog post by bridesandbabes - I thought it would be the cutest idea to get my little flower girls (and ring bearer too) a little book. I already have some ideas for little gifts, but this is just adorable! 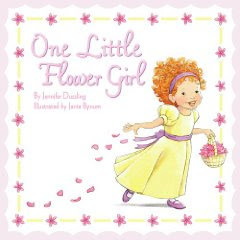 Its called "One Little Flower Girl"... and even though I have two adorable ones (see them here), I think they could each feel special with their own. It is written by Jennifer Dussling. Find it here! This book is adorable! I love it! Have you ever visited Paloma's Nest on Etsy? Caroline has some beautiful things for weddings. One I adore is a small dish for the ring bearer to carry the rings on. After the wedding it is a wonderful keepsake. She not only makes beautiful pieces, but is super nice! If you email her tell her I said Hi! This is such a gorgeous idea. What a perfect little gift that they can cherish forever! !